This award recognises the beneficial role that attending international scientific conferences plays in the development of young clinicians and researchers. SIOP provides young investigator travel awards and the SIOP-PODC Scholarships, but complementary efforts are warranted to give young talents the opportunity to benefit of a privileged moment of shared knowledge and direct discussion with colleagues and with experts in the field before and during SIOP annual conference. 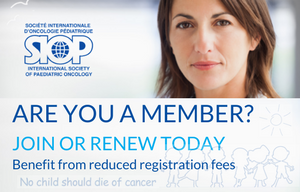 Successful candidates will receive financial support towards their travel and accommodation costs up to EUR 1500, free SIOP membership for one year, free congress registration and complimentary access to the Young Investigator Educational Day. These awards are designed to give young investigators, working in the field of paediatric oncology, the opportunity to present their original research at the SIOP Annual Meeting. Successful candidates will receive financial support towards their travel and accommodation costs up to EUR 1500, free SIOP membership for one year, free congress registration and complimentary access to the Young Investigator Educational Day. For each Annual Meeting, SIOP provides scholarships to people who have insufficient resources to participate and travel to the meeting. Successful candidates will receive financial support towards their travel and accommodation cost up to EUR 1500 and free registration to the Annual Meeting. This prize is awarded to the author of the best scientific article by a trainee in the field of paediatric oncology. The prize is given in honour of Dr. O. Schweisguth, founding member and first President of SIOP. Judgment of the prize will be based on the written article describing work done by the trainee and will consider originality, completeness, scientific accuracy and contribution to science. Applicants must have been in training when the work described in the article was performed, and must still be in the training period or not more than one year thereafter at the time of submission. The prize consists of travelling expenses (return economy air fare between the winner's professional home city and the meeting venue), together with hotel costs and registration fees for the SIOP Congress. The winner will present his/her work at the time of the SIOP Congress and will be printed in a booklet for distribution. The Lifetime Achievement Award is bestowed upon any present or past member of the Society for his/her substantial contributions to paediatric oncology. The Nursing Lifetime Achievement Award is bestowed upon any present or past member of the society for his/her substantial contributions to paediatric oncology nursing. The award will be delivered at the end of the FREE PAPERS SESSION 7: Improvement in care delivery II during the Nurses Closing Ceremony (15:50) held on Monday, November 19 from 15:00 – 16:00. The best poster in each medical/academic discipline, as stated on the abstract submission, is eligible for a poster prize of up to EUR 100. Among other criteria, each nominee must work in a research environment with mentoring and support conducive of continued academic success and innovation; have presented, published, or received funding for highly innovative research with the potential to lead to critical discoveries or major advancements that will accelerate important advances in our understanding of childhood cancer; and have demonstrated participation in team science, in addition to success in innovative discovery. The Scientific Committee selects the six highest scoring abstracts in the fields of basic and translational science, clinical trials and developing paediatric oncology programmes to be presented in the SIOP Awards Session during our Annual Meeting. The presentation judged to be the best in each category will receive an award of EUR 1,000. The Nöllenburg Prize is awarded to the best bone tumour abstract. The abstracts selected for the Nöllenburg Prize Session are determined by the SIOP Scientific Committee. Winners will receive an official certificate and EUR 1000.